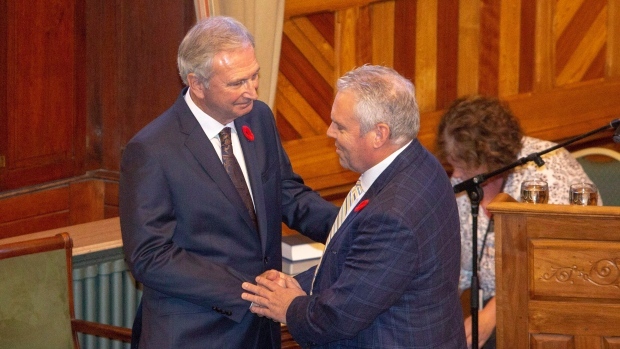 FREDERICTON -- New Brunswick's minority government will hand down its first budget Tuesday, saying it will offer the hard decisions needed to balance the province's finances. Finance Minister Ernie Steeves said Monday the province is paying almost $700-million a year to service its approximately $14 billion debt. "I think it's urgent that we balance our budget. I think it's urgent we try and pay down the net debt, and that's what I'm going to be doing tomorrow," he told reporters. Steeves offered a twist on the traditional new-shoe photo op Monday: He shined up a pair of shoes he'd had for years, rather than buy new. "We're not going to spend new money on new shoes for sure. There will be some new money spent in the budget, though, I can tell you that. It's going to be a good budget," he said. The province had consecutive deficit budgets for more than a decade until a small surplus last year. Steeves said some departments will face cuts, but others will get more spending and some new altogether new spending will be announced. He said the budget will not have big tax cuts, but it won't raise taxes either. He said it will pay down some of the province's accumulated debt. The budget will have to win the support of at least one opposition party, but the People's Alliance has previously announced it would back the minority government through its first 18 months. "I mean, you gotta make hard choices and the thing is, for the last 12 or 13 years we've gone through successive governments and they haven't made hard choices," Steeves said Monday. But he said Tuesday's budget won't be about cuts: "It really isn't. It's about efficiencies."